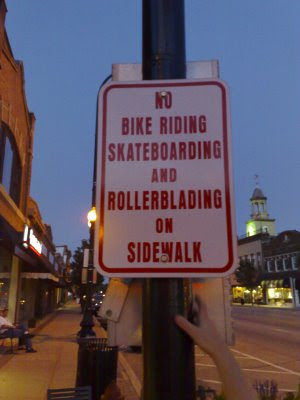 Literal interpretation would have you believe they don't allow you to bike ride skateboard and rollerblade all at the same time, but any of the individual activities are permitted. If they would have used "or" this sign would have made sense. Logic Statements. If somebody can make a graphic of someone bike riding skateboarding and rollerblading with the anti circle and stripe (I think this would be a good issue for fark's photoshop thread, how do you submit there?